As early as the 16th century quinine bark was being used to treat fevers. It was found that the bark from the quinine bark tree, the various Cinchona-species, was effective against remittent fever, or malaria as we say today. Great quantities of bark were therefore transported from South America to Europe. The discovery has been assumed to be due to brothers of the Jesuit order and it was hence commonly traded under the name Jesuit bark. It is sometimes also called China bark, but the name has nothing to do with China; it derives from the Indian name of the bark, quina-quina or kinakina. During the 18th century it was found that it also stimulated the heart. In 1820 two French pharmacists isolated a substance from the bark, quinine. In 1820 it was shown that a salt, quinine sulphate, was excellent for treating fevers. Several similar substances have been refined since then, amongst them is quinidine which is still being used for cardiac illnesses. 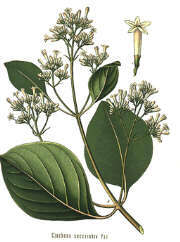 At the beginning of the 20th century, plantations of quinine bark were opened in Indonesia and therefore the collection of bark in South America was discontinued. Quinine was an unbeatable product against malaria. During the Second World War the Japanese occupied the quinine bark plantations which led to a shortage of quinine for the allied troops. This led in its turn to the production of synthetic products based on the chemical structure of quinine. A French stamp which celebrates the discovery of quinine in quinine bark. 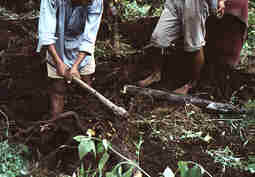 Harvesting quinine bark for the extraction of quinine. By the end of the war, virtually only synthetic malaria products were being used. However, the malaria parasite managed in time to develop resistance and survive many of these synthetic products. In some areas quinine still works, but the parasite is starting to survive even medication with quinine, which calls for the development of new anti-malarial drugs. As an alternative, artemisinin, a substance from sweet wormwood and derivatives is beginning to be used.